Most people are pretty ambivalent when it comes to animal experiments for medical research. Ask about cosmetics research, and the general consensus is that it’s cruel, unnecessary and outdated. But when medical research is discussed, many people will say something along the lines of, ‘Well, yes, it’s not nice, but I bet you’d change your mind if you or your mum needed treatment.’ I’ve actually heard this argument a number of times. And it’s hard. Of course it is. You can never predict what your reaction would be in such a situation. But the question remains whether I, should I ever need such treatment, would be happy knowing that it had been developed using methods that involved the intense suffering of several thousand animals. (Answer: I wouldn’t. But would I have a choice of treatments? I doubt it.) There is an article on the DHT website that details why cancer researchers would be better off not using animals. ‘If animal experiments work,’ they ask, ‘then why hasn’t a cure been found yet, not just for cancer but for other diseases?’ This is a good question which, in my mind, not enough people ask. I know I’m treading on dangerous ground, here. More people will disagree with me than agree, and many may think I’m delusional or kidding myself. But I’m really not. I’ve thought about this stuff for years and I invariably reach the same conclusion. Thalidomide is what I always return to. Given to pregnant mice back in the 60s, there was no adverse reaction, and the young were born healthy. I don’t think I need to remind anyone what happened when the same drug was given to pregnant women. I know this is only one example, but there are many. You just have to look for them. And one example, some would say, is one too many. Conversely, of course, many drugs that have been tested on animals and turned out to be toxic to them may not, as a consequence, have been released for human trials – and these are drugs which may be beneficial for humans, meaning animal tests are not only the harbingers of intense suffering for the animals involved, they’re actually depriving people of perfectly good medical treatments which may even save lives. The whole thing, in my view, is completely nonsensical, and things need to change drastically. I don’t hold out an awful lot of hope for this, sadly, as there are too many fingers in too many pies and companies put way too much importance on their bank balances. Ethics, morals and even common bloody sense don’t come into it, and this is why I’m very glad the Dr Hadwen Trust exists. While I’m on my rant, I’d like to think that now, well into the 21st century, we would have less need than ever for the RSPCA. Sadly, the opposite is true, with rising numbers of cruelty convictions, and rescue centres overflowing with abandoned animals. On the 30th of June, I attended the AGM at the Imperial War Museum. As a member, I am allowed to vote for council members, and this year I was gratified to learn that the four I voted for all got in. During the three hours we were in the room (it was scheduled for two hours, but overran), I heard some truly shocking stories of cruelty. One was the tale of Maggie May, which was devastating to listen to, and was only one of so many cases like it that the RSPCA (and similar charities) have to deal with every single year. I simply fail to comprehend what goes through the minds of the sort of people who carry out these horrific acts of cruelty, and I’m not even going to try, because it would actually drive me mad. Back in February, I wrote about the pedigree dog industry (and yes, that’s precisely what it is until things start to really change) and since then, I’ve kept in touch with Helen Coen of the RSPCA, who has been keeping me up to speed with some of their work. 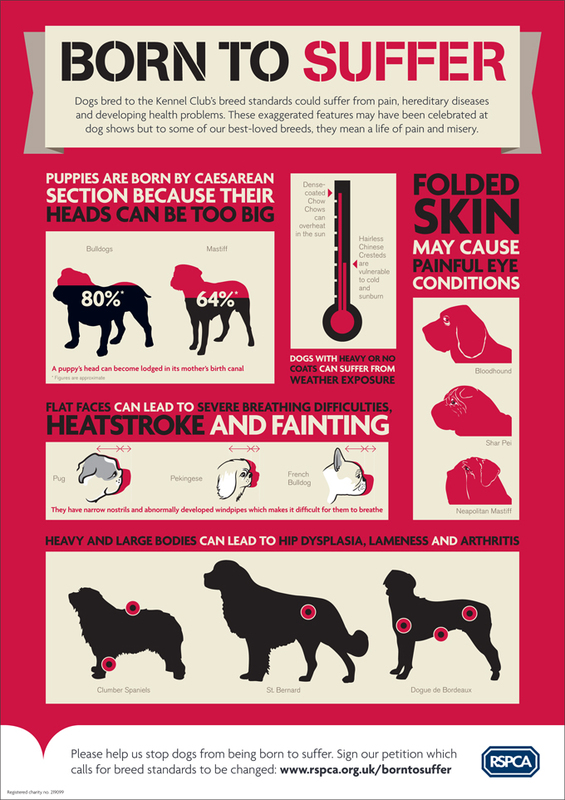 Born to Suffer is their campaign to stop the indiscriminate breeding of pedigree dogs when they have inherent problems, such as twisted spines (pugs), flat noses (bulldogs, pugs) and life-threatening conditions such as urate stones (dalmatians). Since the beginning of the campaign, the Kennel Club has identified 15 ‘high-profile’ breeds which have health and welfare problems. A study by the Royal Veterinary College has shown that owners of short-nosed dogs dismiss their obvious breathing problems because they see it as being ‘normal’ for the breed. This is insane. Owning a dog means you have a responsibility to that animal to ensure its life is as comfortable, pain-free and happy as possible. How can short-nosed dogs be any of those things if they can hardly breathe? Added to this insanity, six dogs recently failed vet checks at Crufts because they had visible health issues. As a result, they were not awarded Best of Breed prizes. Just what are people thinking? It simply doesn’t make any sense. Please add your name to the campaign and help turn things round. Another campaign the RSPCA are currently working on is called 42 Teeth, for the simple reason that all dogs have that many. The Dangerous Dogs Act of 1991, which (if I recall correctly) came on the back of much publicity about dogs mauling small children and adults, has failed on so many levels. It isn’t only certain breeds who have the potential to bite and do damage. They all have 42 teeth and all can hurt people. However, that’s not the real issue, here, is it? Dogs can’t help who their owners are. Many of these owners actively encourage their dogs to be aggressive. As many attacks happen in the home, the owners of these dogs are rarely prosecuted – the current legislation doesn’t cover private property, so they get let off scot-free. Also, breed-specific legislation needs to be abolished. It’s not the breed of dog that’s the problem: it’s the owners. Dogs have to be trained to be so aggressive. Some of these dogs are actually microchipped, but the RSPCA are calling for the Government to make sure the records of microchipped dogs are kept up to date. This will help trace and prosecute owners of aggressive dogs and make the RSPCA’s work a bit easier. The society is also calling for more education about this issue, to prevent these attacks happening in the first place. It simply isn’t fair if, when a dog attacks someone, it’s the dog who’s punished by being put to sleep. Punish the owners, not the dogs, and punish them hard. Make it clear that this behaviour won’t be tolerated. Hit them where it hurts (their wallets, usually) and include a mandatory prison sentence. Dogs can often be re-trained by experts. If they can’t, then that’s the pity of it, because there’s really no other option apart from the most final one. But please stop blaming the dogs. It really isn’t their fault they have defective owners. Click here for a short video from the RSPCA on this issue. Lastly, Hay Fever, the campaign to educate people about what rabbit food really is. We’ve all heard of people complaining that salad is ‘rabbit food’, right? Well, guess what? It isn’t. Rabbits eat hay and grass, and such treats as carrots are just that: treats. You wouldn’t bring up a baby on only chocolate and sweets, now, would you? 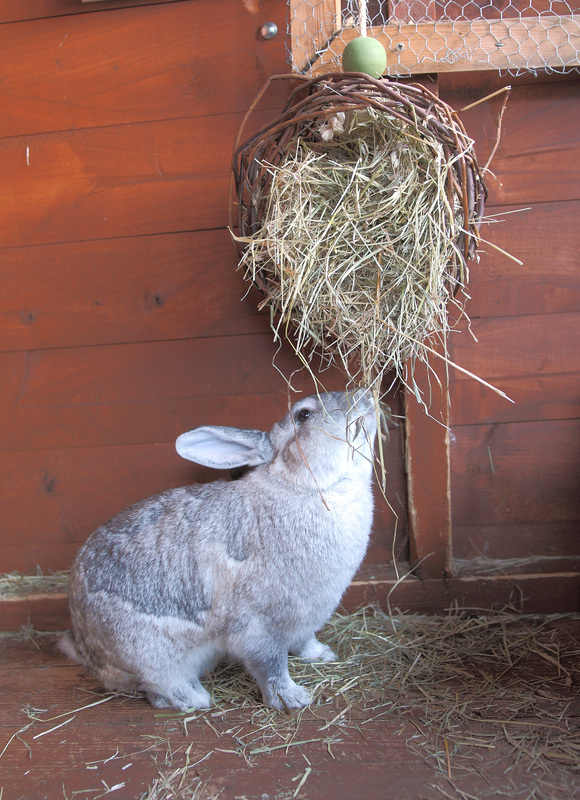 In a recent survey of rabbit owners, only 8% of them knew that grass and hay are the key components of a rabbit’s diet. This is shocking, and needs to change quickly. The RSPCA have produced a short film to support this campaign and there is a section on the society’s website where you can find more information about this issue. It’s so important that these things are considered, discussed over beer, spread among friends and eventually, directed towards the Houses of Parliament. The Government needs to put animal welfare much higher up on their agenda than it is at the moment. This has always been one of my passions, and those who know me well know how much I respect and care for animals of all kinds. Unfortunately, I don’t think we’ll ever live in a world where everyone feels the same respect for animals, so do feel free to join me in my flag-waving activities. The RSPCA, the Dr Hadwen Trust and other animal charities need support now as much as they ever did. Please help me make sure they get it. Though I support all animal charities I very much dislike the RSPCAs record on many things including I’m very sad to say putting healthy animals to sleep. Thanks Helen. I also have a lot of bad experiences with the RSPCA over the years. Last time was the other year when we called them to see an injured goose that had been attacked by a few others. The guy came with waders and other equipment but refused to get in the shallow water and do anything to try and catch it and then left. I was so sad and stayed there for hours watching it to see if it was ok. I had to leave at night as its dangerous in the area and to this day hope the goose didnt die. BTW |I have heard about the RSPCA putting healthy animals to sleep all my life – not just in the current economic climate..But thanks for the reply.